Friday, March 4th: the quite relatively tan and avocado filled adventure duo of Katie and Josie shall fly out of the Tangier Airport approximately 17:45 bound for Frankfurt. Austria isn’t too atrociously far from the bustling metropolis of Frankfurt, Germany. It will be easy, they thought. Just get back to Graz, they said. Flying intercontinentally between Africa and Europe subjected a mere 2 hours and 21 minutes from the lives of the duo, a grand round of applause for the Ryanair flight team for making it to the continent a zippy 24 minutes ahead of schedule. We touched down on Friday night, local time 21:06. In our infamously optimistic ignorance we fully expected to be nestled between the sheets of our respective Austrian covers by Saturday night. Well friends, Saturday night came, as it tends to do. And yes indeed, we were both fully present for the occasion. Unfortunately the so-longed-for Saturday night covers were exchanged for the hard cement ground outside the Pescara, Italy train station, huddled together in a daze of post-pizza hums and under the carefully judgemental eye of the train station guard, humorously pacing back and forth within the train station itself, clearly visible from the outside windows upon which Katie and I reclined as he continually denied our entrance into his protected domain. A much different experience, as one might imagine. Sunday night also came, as is also its fashion. Katie and Josie; present and accounted for. Much to our continual chagrin, the so-longed-for Saturday night covers were again exchanged with Monday night sharp rappings on the exterior door of a large white shed, disconcertedly situated in the middle of a Slovenian city park behind a crowd of tall pines; our only assurance being the single piece of white printer paper boldly declaring the words “HOSTEL” in italicized 72pt Times New Roman font tacked to the hard plastic door upon which our knuckles were getting quite the bruising from repeated knocking. Shall I recount the tale of our 62 hour journey home from Morocco? I am afraid to say that I have almost no choice in the matter. It’s too juicy to not be expressed in archaic language and elongated run-on sentences. Katie and I planned and prepared our voyage to and around Morocco a full and appropriate 2 weeks in advance to take off; despite the tiny ratio of planning to backpacking time, we were quite thorough in our preparations. Not only did we plan and book how to get to Morocco, but we also planned and booked how to get back. If you had happened upon a reading of the first Moroccan adventure post, “Not Even to Morocco”, you would be familiar with the disruption of expectation concerning how to get from Graz to the Frankfurt airport, due to a miscommunication in which airport Ryanair flew out of and the bothering fact that a secondary surprise airport even existed in Frankfurt; the correct one of which of course we were not bound for. So getting on the Ryanair flight to Fes included showing up at 4 in the morning and finding out we must wait for 2 hours to catch an hour long bus to chart us to the retro Hahn airport. I digress, you can read about that below. Having bought return tickets before realizing our mistake, we found ourselves at the conundrum of having invalid bus tickets for our purposes. We would simply not have enough time to make it back to the Frankfurt main airport in order to take the night bus to Munich; thereby missing the connection to Salzburg and likewise to Graz. So, one relaxing and lounging Tuesday afternoon in sleepy Essaouria, Katie and I brewed ourselves strong mugs of mint tea and perched upon the thick cushions of the Atlantic Hostel rooftop terrace and researched a second way to get home. We found that the most efficient way to return would be to catch a 13 euro Ryanair flight from Frankfurt Hahn airport to Pescara, Italy on Saturday at 12:25. From Pescara, we would board the 3:00am Flixbus to Udine, Italy, wait 45 minutes, and then continue our voyage from Udine to Graz. Refunds were situated, new tickets were purchased, stress was relieved, smiles ensued; more tea was brewed. Things were going as planned: we entered the Frankfurt Hahn airport, found some truly capital blue hard plastic benches upon which we could wrap ourselves in scarves and burrow into the scooped chairs for the night. Friday night passed as one might expect for a night spent in such a manner, and we emerged from a tossed 3 hours of sleep to some cheap McDonald’s airport coffee the next morning. Things commenced with the pattern of going as planned: we boarded the flight to Pescara around noon, finding ourselves backpacked-up and roaming around the beautiful downtown area by 2. To our utmost happiness, a large bustling chocolate market greeted us from the moment we entered the square, and as we munched on true Italian canolis, we knew that these 11 hours of which we must find means to entertain ourselves would pass well and in a fashion echoing our Munich layover. 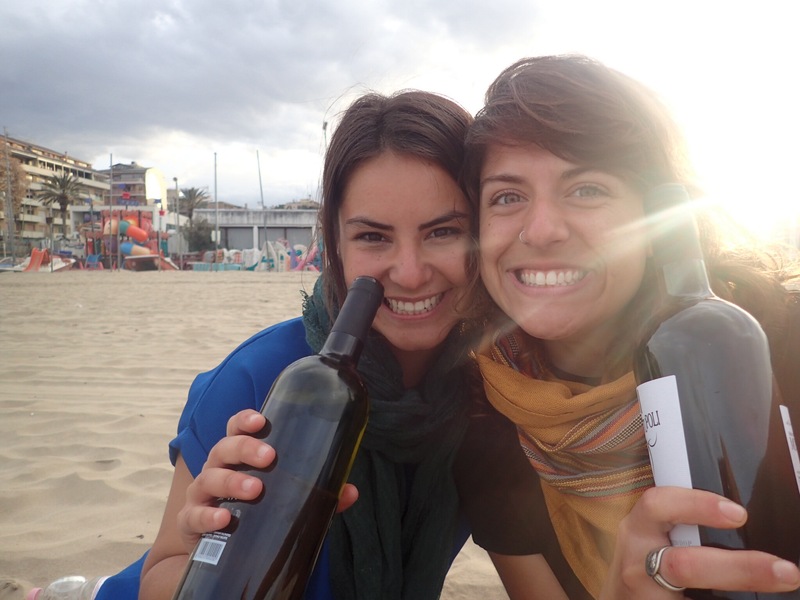 We zipped to a small market, purchased some Italian wine, meandered some more, found delicious pizza, and made our way to the shores of the Mediterranean. We chucked our travel weary packs down upon the soft sand, excitedly wiggling out of our socks and shoes and digging our slightly crusty toes into the grains. Katie and I reminisce gloriously on our past month together, passing the bottles of wine and exchanging words on how much we appreciate and love the other. At 9pm, we take back to the streets, searching for a sturdy gelato stand to conclude our truly stereotypical Italian meal. We clamber into a small shop and emerge successful in our searching; cafe and Oreo gelato for Josie and dark chocolate orange gelato for Katie. As we sit and people watch on the terrace of the shop, a band of four Italians, all roughly our age, come and sit down in our vicinity. Our fondness for other humans takes control, and Katie and I found ourselves immersed in a miraculous conversation with the Italian equivalents of Russell Brand, Cedric Diggory, Michelle Monihan and Tyler from Fight Club. They grab us by the hands and gallop us off to their favorite hole-in-the-wall wine bar and purchase a bottle of Chardonnay; we pass it around, basking in our new friendship and learning tricky rather racist Italian phrases. More Italian buddies come to join the group, and we bustle our way to an outdoor market concert venue where an Oasis cover band is riling up a group of 70 or so beautifully dressed Italians. We jump up and down and dance wildly amidst the throng of leather jacketed gorgeous human beings, our large packs bobbing up and down from their perch on our backs. In hindsight, we probably should have been more self conscious of the fact that we had been wearing the same clothes for the past three days and that the showering hadn’t been all that consistent. But in the light of our friendships, it was absolutely trivial. We bid them a farewell around 2am and head to the train station on top of the world. The tight fisted police man gestured to the cold cement outside the train station doors and told us that we could “wait for the bus not inside my train station” here. It was a miracle that Katie and I found ourselves on the 3am bus to Pescara with all of our baggage and packs accounted for; despite the rigidity of the cement ground, the lack of sleeping took precedent and both of us fell asleep for a time waiting, wrenching ourselves to a grinding alertness at the capital timing of 2:53am. Things further appeared to be going as planned: we reached the bus station of Udine at precisely the aforevisioned time and waited our expected 45 minutes until the bus that would charter our final leg would arrive. Unfortunately, as it happens, this day was Sunday, March 5th: it was not the Wednesday, February 22 that we had mistakenly bought the bus tickets for. And thus here is where the adventure began. Alright. How do we get back to Graz as cheaply as possible before our classes start on Tuesday morning? We found an 8 euro train ticket to Trieste, waited the necessary 48 minutes until arrival, and then in Trieste happened upon a 6 euro bus ticket to Ljublijana. We jaunts around the beautiful coastal town for two hours and then meandered back to the bus station, snuggling in as we bumbled across the Slovenian countryside admist the sunset. We arrived in Ljublijana with high expectations of making a connection to Graz; but to no avail. The time was 22:13 at this point, the last train to Graz having left only an hour ago. No matter; this fact could not extinguish the fledgling fires of adventure that raged within the chests of Katie and I as we figured out how to get just that much closer to Graz. We boarded the train to Maribor, Slovenia, after a very friendly Slovenian husky call of “Go to platfurm 12 na-ow. You ‘ave see-ven minoots” from the wonderful ticket saleswoman. Side note: every Slovenian person I have been so fortunate to encounter I have nothing but absolute palpable love for. If you are Slovenian, I probably love you too. We arrived in Maribor to find that our best option was to catch the 8:33am train to Graz, as the current hour was quite late. We pawned the wifi from the Illy cafe outside the station, and found the aforementioned white shed hostel. After a good 10 minute pounding on the plastic white door, the most unexpectedly pleasant and wonderful Brazilian man, clad in his pajamas, answered and escorted us to the cleanest and most comforting attic double room, thick goosey pillows and comforters beckoning us from the beds. Despite the initial rising feelings that this could perhaps be the residence of a serial killer and indeed we might have deserved our fate to stumble so aimlessly into such a poorly executed ploy to attract desperate voyagers, Katie and I had such a wonderful grand night tucked up in our attic. And indeed, the room was most gloriously nicer than all of the hostels in Morocco and our own respective Austrian flats combined. We popped over to the train station the following morning, our high spirits still radiating through us. We purchased cheap tickets to Graz, had the most markedly entertaining language-barrier conversation with the cafe woman that I will never forget, and hit our beautiful Graz around 10:30. One might imagine this unexpected turn of voyaging events to be quite horrid; indeed, it probably was. But due to our high levels of infamously optimistic ignorance, we didn’t see it that way. It was the height of adventure, train hopping from city to city, trying to get closer and closer to Graz as cheaply as possible, not having necessary obligations until Tuesday. There was absolutely no way that our adventures could have concluded in a more appropriate fashion.